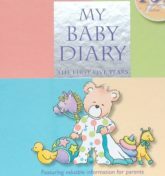 My Baby Diary is a beautiful keepsake of your baby’s milestones from birth to five years old. It’s a wonderful way to remember all of your baby’s very special moments. My Baby Diary is also packed full of useful information for parents. CLICK on the images below for more details and price information. We have limited stock of My Baby Diary, so be quick. You can purchase online now for $20 (including postage within Australia) or $25 (including international postage).